The competitive electricity wholesale market will be fully operational starting in 2019 following a successful year-long pilot period. An increase in world oil prices is helping Vietnam earn money that will quicken its already fast economic growth and may help the country build new infrastructure. The only red light: higher fuel prices among Vietnam’s consumers. The north-south high-speed railway should be seized as an opportunity for the country’s manufacturing sector and labor, a senior official says. The Vietnamese government has passed a ruling approving a 350% raise in penalties for food safety violations. A group of environmental NGOs has called on the European Union to postpone signing a trade deal on tropical timber with Vietnam until Vietnam declares a moratorium on illegal timber imports from Cambodia’s forests. Although full-year inflation will probably be contained at less than 4%, the average consumer price index (CPI) in the first nine months of 2018 was already 3.57%, putting the efforts to curb inflation in the remainder of the year under even greater pressure. The Ministry of Agriculture and Agro-Based Industry Malaysia (MOA) has announced plans to suspend imports of chilies from Viet Nam after detecting residue of chemicals used for plant protection exceeding the permissible level. The Vietnamese rice sector has made strides and achieved positive results over the past few years, with annual rice exports accounting for approximately 15% of the total volume of global rice exports. However, the brands of Vietnamese rice are not yet known by the majority of foreign consumers. The combined pre-tax profit of enterprises operating in Vietnam in 2017 was reported at VND876.7 trillion (US$37.46 billion), up 23.1% year-on-year. They paid VND954.1 trillion (US$40.77 billion) to state coffers, up 10.8% year-on-year. Many Vietnamese firms want to boost exports of agricultural products to China via official channels to gain higher value and avoid risks from unofficial cross-border trade, but face a number of difficulties in seeking to bring their trade above-board. Vietnam has a high percentage of internet and social network users, but the proportion of people making payments via internet remains very modest. Vietnamese Prime Minister has given the green light for Ho Chi Minh City to build three hospitals, estimated total investment of US$240 million. Viettel Group on Monday in Hà N?i officially announced the establishment of the Viettel Business Solutions Corporation, marking a move into its so-called fourth development stage. Premium and luxury apartments in HCMC are seeing high absorption rates while those in Hanoi get few takers. If US-China trade tensions drag on, Vietnam will still see good growth but face strong exchange rate pressures exerted by two major currencies. The result remains a long way off achieving the target of US$3,200 – 3,500 by 2020, local media reported. Shopping malls are mushrooming outside HCMC’s central business district, a new report by Jones Lang LaSalle Vietnam says. So far this year, authorities in the northern province of Bac Ninh have licenced 148 new investment projects worth US$376.154 million. Vietnamese dairy firm TH True Milk (TH Group) on October 14 received nearly 1,800 3 or 5-month pregnant dairy cows, which were inseminated through embryo transfer from high-yielding US dairy cow Holstein Friesian. The projects are estimated to cost US$83 million, financed with debt and equity. AC Energy will participate with at least 50% economic share. The Thu Thiem Tunnel is an underground road tunnel designed to cross the Saigon River in Ho Chi Minh City, the largest city in Vietnam. A number of commercial banks are rushing to divest shares to withdraw capital they contributed to other banks many years ago. The ongoing session of the National Assembly (NA) is the final preparation for the upcoming NA plenum, which is set to start on October 22. Ayala Corp on Monday said its subsidiary AC Energy has signed an Energy Performance Certificate (EPC) and financing documents to build its second renewable energy platform on Vietnam. A ceremony was held at Tan Son Nhat International Airport in Ho Chi Minh City on October 15 to see off the second group of Vietnam’s first Level-2 field hospital to the United Nations peacekeeping mission in South Sudan. Descendants of Japanese soldiers who fought in Vietnam during World War 2 have enjoyed a tea ceremony with a message of peace. Grab and every ride hailing firm in Vietnam may soon have to display electronic lights on their cars showing the word ‘TAXI’, if the Government approves a proposal from the Ministry of Transport (MoT). The first waste-to-energy plant in the Mekong Delta city of Can Tho began trial operation on October 15. This week’s Vietnam morning news feature photo acknowledges International Day for Rural Women, October 15. 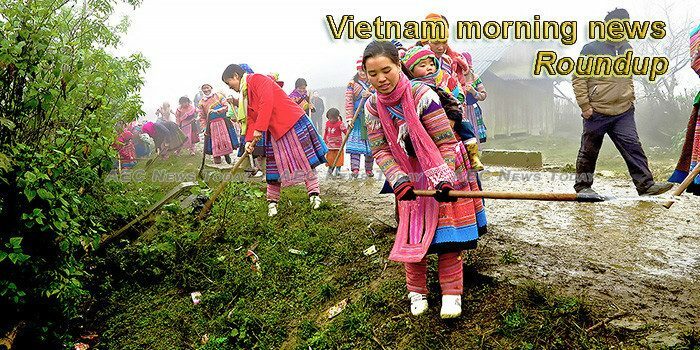 Vietnam morning news by AEC News Today is your one stop source for Vietnam news on matters of governance and policies affecting Asean business communities. It is published M-F by AEC News Today: Governance, not government; policies, not politics. Sreypov Men recently completed a course of study in International Relations at the Institute of Foreign Languages.